The song was based on Ecclesiastes 3, verses 1-8. It was a long time before I could read the passage in the Bible without wanting to insert “turn, turn, turn” at the end of each line. Longer still before I began to understand the universal and powerful truth in the verses. 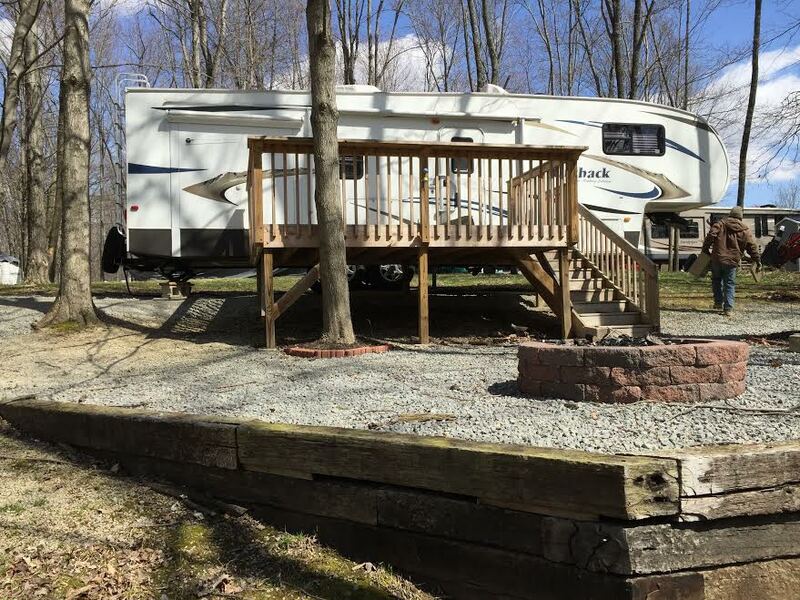 My camper became my writing retreat. This week I found out that some damage done to my camper is extensive. So extensive it isn’t worth the reapirs. That may not seem like a big thing to most people, but its loss is significant to me in ways most people cannot understand. Tom and I bought the camper the summer before he died. We used it three times that summer and the plan was to spend January and February in Naples, Florida during 2015. That much further south than our home in Tampa is warmer that time of year. We’d sold our house in Ohio so we’d be “footloose and fancy free.” It sounded exciting and fun. We had plans. But as the Bible says…or in this case, as the Byrds sing, there is a time for everything. “A time to be born and a time to die.” Tom’s time to die came in October that same year. There’s also a time to deal with practical matters. I didn’t know what to do with the camper. I knew I couldn’t haul it anywhere unless I could drive without ever turning right or backing up. I first tried to sell it but that didn’t work out. Then I learned I could have it moved it to a seasonal campground and keep it there, camping in it whenever I wanted. 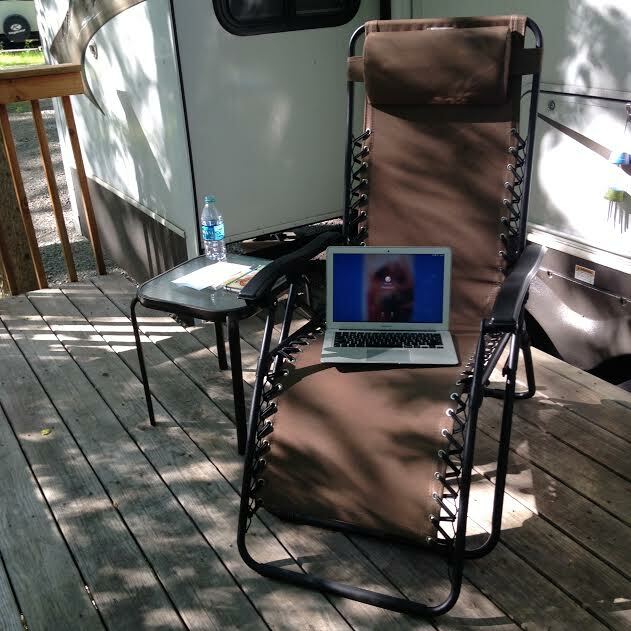 My "office" at the camper. That camper served me well. 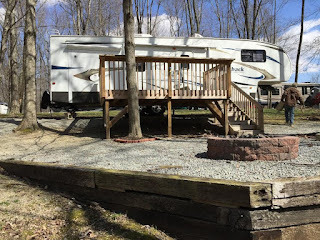 I had plans for this summer at the campground. I hadn’t seen many of my fellow campers in a long time. During the second season, I moved into a new house and then turned around and moved to Kosovo. This summer was going to be different. I pictured myself at my little writing retreat churning out new books now that I was writing again. But then there was damage to the camper. Water got in. Water is not good for campers. The damage was extensive. When the man I called on to make the repairs told me how bad it was, I cried. Right there on the phone. Poor man. You see, the camper represented a piece of life I’d lost. It represented a connection to Tom and the dreams we shared. But as the song says, “turn, turn, turn.” There is a season for everything and a time I need to turn around and head a different direction. I halfway expected her to say, “turn, turn, turn” but she didn’t. But I am doing just that. I’m turning a different direction. I’m learning how to make it in this world alone. It’s the season of my life. "Please God, Give Me Patience...RIGHT NOW!"